Braun’s refreshed Series 3 line is set to maintain its strong position in the affordable shavers segment. The Series 3 ProSkin 3040s, the successor of the highly popular 340s-4, is likely to become a best-seller by balancing costs and features. This, along with its worldwide availability make the 3040s model the pick of the ProSkin range. Without further ado, let’s see how well the Braun 3040s performed in our review and if it would be a good fit for you. We’ll also compare it to a few similarly priced options from Braun and from the competition. Wrapup — Who should buy the 3040s? The 3040s is part of the wet & dry razors from the Series 3 ProSkin and sits somewhere in the middle of the pack considering its price and features. 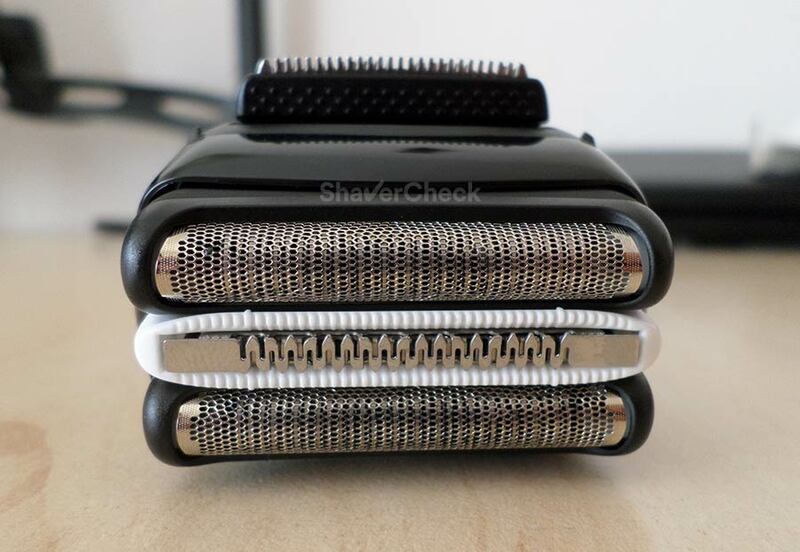 The shaver comes with the usual three blade setup, with two outer foils for cutting stubble close to the skin and one middle trimmer that deals with longer hairs. Around this trimmer there is a micro-comb that should feed hairs more effectively to the cutters. The three cutting elements can move independently and the blades and foils are integrated into a single cassette, so they can’t be bought and replaced separately. The shaver also has an integrated long hair trimmer, a 3-level LED indicator for battery status and can only be operated cordless. Other noteworthy features are the 5-minute quick charge option and 100% waterproofing, allowing it to be used in the shower as well. Overall, the 3040s is a basic, no-frills razor that gets the job done. Upon first holding the razor in hand, you will notice that it’s nicely weighted and has substantial girth. The generous blue rubber inserts provide a fantastic grip and can be handled very securely, even when it’s wet or covered in foam. The materials used are plastic with both matte and glossy treatments; the razor feels very solid and durable and in my subjective opinion it looks even better than its predecessor. The power button is rubberized and it takes quite a lot of force to press it. Since the 3040s doesn’t feature a travel lock, I guess this is a good thing as there is no way you could turn it on by mistake. The protective cap does extend over the ON/OFF switch and also acts as a travel lock, so props to Braun for trying to make up for the lack of a built-in one. Overall, the 3040s fares very well as far as build quality and ergonomics are concerned. 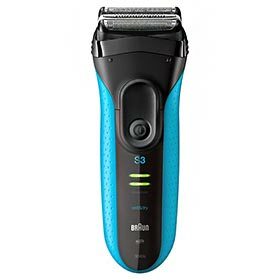 I would have liked the body of the shaver to taper a bit since it’s rather bulky, but with that generous grippy teal rubber, it’s not really an issue. My only other gripe with the otherwise excellent ergonomics has to do with the use of glossy plastic on the shaving head. It becomes very slippery when wet or when used with shaving cream and it’s a bit of a pain to remove. Besides, you must be extra careful as you have to squeeze the sides hard to remove it and when the head finally pops out you could drop it and damage it. In the case of the 2030s, it’s pretty much the usual business with regards to battery life and charging. As previously mentioned, the razor can only be operated cordless as a safety precaution. To do that, it comes with a rechargeable Ni-Mh battery that provides enough power for 45 minutes of use. Charging the razor is done with the included brick, pretty compact in size and one that also features the old extendable cord (it was discontinued and replaced by a regular, straight cord). The shavers sold in the USA will come with a USA power plug (my review unit was bought from Europe). There is a convenient 5-minute quick charge feature for those times when you’re in a hurry and the battery is completely drained. Speaking of which, battery life proved to be excellent, pretty much on par with the best razors I’ve used in this regard. I constantly got a bit more than the claimed 45 minutes from a single charge, so battery life is very solid. The refreshed Series 3 also includes shavers that come with Braun’s excellent cleaning & charging station, like the 3090cc and 3050cc. That’s not the case with the 3040s in our review, so you’ll have to resort to manually cleaning your razor. And that’s pretty easy to do. 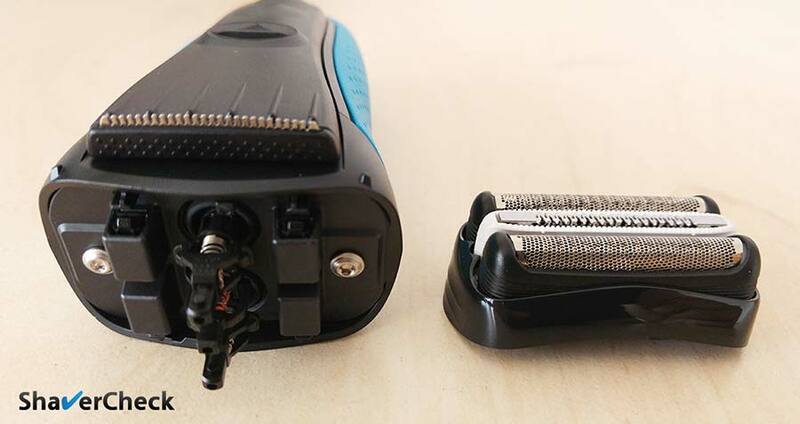 If you use the 3040s for dry shaving only, just remove the shaving head and tap it out on a flat surface. With the included brush, remove the hair clippings and debris from the inner area of the head. Do not use the brush on the foils or inner blades as this can damage them. You can also rinse the parts under running water for a more thorough cleaning. Once in a while, it’s a good idea to use a bit of liquid soap and hot tap water to remove older debris and grit that may have stuck to the cutting parts. This cleaning method is mandatory after every use if you’re shaving with cream or gel. 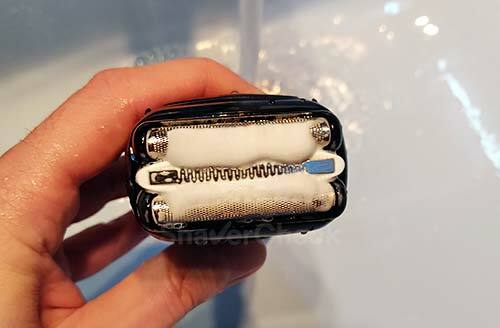 This is when a shaver that has separate cutters and foils is usually easier to clean; Braun uses a cassette that integrates both, making it a bit more difficult to clean thoroughly compared to a Panasonic foil shaver for example. To maximize the performance and minimize the wear on the cutting parts, it’s recommended to apply one drop of fine machine oil on the foils once a week, especially if you regularly clean your razor with water. Braun includes a small bottle of lubricating oil with some of its razors. But not with this one, which is a bit odd since it’s a wet/dry shaver that is likely to be cleaned with water and soap. Let’s now get to the most important part of the Series 3 3040s review and see how well it shaves. I was actually expecting a familiar experience with the 3040s since it’s not very different from the older Series 3 380s-4 and 340s-4 I reviewed some time ago. It turns out I was right. And that’s a good thing for the most part. 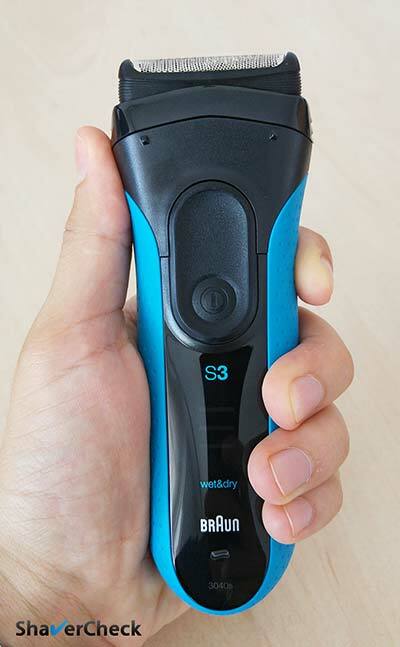 I used the Series 3 ProSkin 3040s as my only shaver for two weeks; during this time, I shaved daily, every other day and every two to three days. The dry shaving performance was quite good overall; I got the best results when I shaved more often with the 3040s. This wasn’t a surprise as in my experience the lower end electric razors yield the best results when used daily or every other day. The closeness was adequate for the most part and the comfort excellent. The razor does a very good job at shaving short hair, but has some trouble with longer, flat-lying hairs from a few days of growth. Some were left behind and I had to go over certain areas a few times. Again, nothing out of the ordinary for a basic electric shaver. In fact, it was quite a bit better compared to other similarly priced electric razors, like the Arc 3 from Panasonic. I didn’t experience any discomfort during use, be it irritation, razor burn or hairs being yanked. Also, using an electric pre-shave (Speick pre-electric lotion in my case) seemed to help. While the dry shaving experience was good, using the 3040s with shaving cream was even better, especially with regards to closeness. I know most men will prefer to shave dry as it takes less time and you don’t have to mess around with lather, but if wet shaving is your thing, you can definitely use the 3040s with your favorite cream or gel. The Series 3 is definitely not the quietest electric shaver out there; it emits a raspy buzz and also vibrates a bit more than Braun’s high-end shavers. Overall, I highly recommend buying this razor if you’re planning on shaving daily or every other day and need a gentle and inexpensive shaver; longer hairs can be a challenge for even top of the line razors. 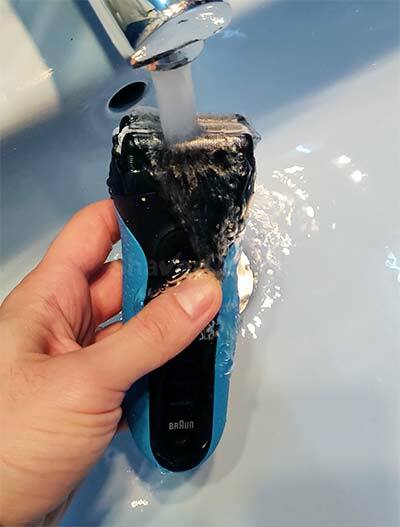 In my subjective experience, the Series 3 from Braun can sometimes feel a bit under-powered and as a result shaving takes somewhat longer than with other shavers (more on this in the alternatives section). However, this will only be a problem if you have very thick and dense facial hair. While shaving dry, the middle trimmer did get a little hot. The two outer foils remained comfortably cool though. I strongly recommend putting a drop of fine machine oil on the middle trimmer if you’re planning on using it dry, as this helps with the heating issue. The long hair trimmer was a bit of a mixed bag. While its positioning and shape were spot on, it didn’t feel sharp enough. When tweaking my sideburns it would sometimes leave hairs behind, even after additional passes. To be honest though, even the Series 9 trimmer works pretty much the same, so I can’t really complain. No travel case or lubricating oil are present unfortunately. My particular review unit, that had Limited Edition written on the packaging, included a free 32b shaving head replacement as seen in the image above. This was a very pleasant surprise that pretty much makes up for the lack of other accessories. 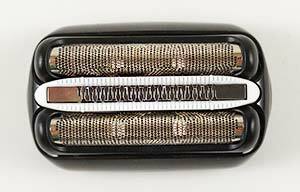 The updated Series 3 ProSkin uses the same 32b/32s replacement cassettes as the older razors. They now feature a redesigned micro-comb around the middle trimmer that comes in white instead of black. Other than that, they seem to be exactly the same. And that’s probably a good thing since they tend to last more than the average cutters and also cost less. The Series 3 3040s is definitely a great product in its category — an affordable, solid razor that offers good value for money and performs very good, especially when more often. If we consider Braun’s reputation for making reliable products, the inexpensive and long lasting replacement cutters and the reasonable purchase price, the 3040s is shaping up to be a pretty sweet deal. Anyone who doesn’t need all the features of premium razors but also doesn’t want to pay the premium price should consider it. Beginners should also look at the 3040s for their first shaver. Its great ergonomics, decent price the fact that it’s a basic razor, easy to use and to maintain make it a solid option. The smooth and comfortable operation make it suitable for men with sensitive skin. Lastly, its wet shaving capabilities were impressive, so I highly recommend it for shaving with cream or gel. As I said in the performance section, my only real complaint about the way the 3040s performs is that it doesn’t shave quite as close, especially when compared to similarly priced Panasonic models. An Arc 3 Panasonic like the ES8103S that has a 13 000 CPM motor will shave faster and closer. On the downside, the Panasonic uses cutters and foils that are more expensive and, at least in theory, wear out faster. The Panasonic is also a bit more aggressive, epsecially during a dry shave. So if you have sensitive skin, it may not be the best option. Another option would be the older Series 3 340s, which is basically identical, apart from a few visual differences. Since they’re similar in the way they perform, simply buy the one you can find cheaper. Finally, there’s the issue of wet and dry use. Some men will never use their electric razors with shaving cream; they don’t want the extra hassle of lathering and cleaning the razor or it simply doesn’t make much of a difference in terms of closeness or comfort. If you’re in this situation, you could opt for the Braun Series 3 3050cc. 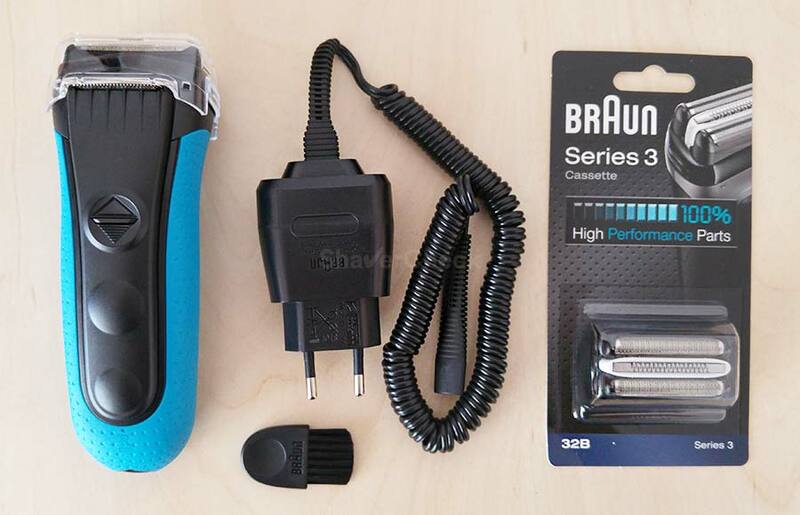 It is basically a 3040s without the wet shaving seal, but for a few extra dollars, the 3050 comes with Braun’s excellent Cleaning & Charging station so you won’t have to worry about cleaning. Just shave and drop the razor into the base to have it sanitized and fully charged, ready for your next shave. You can read our full review of the 3050cc here. You don’t say how long the CHARGE lasts? I actually mentioned that it lasts for approximately 45 minutes of use. 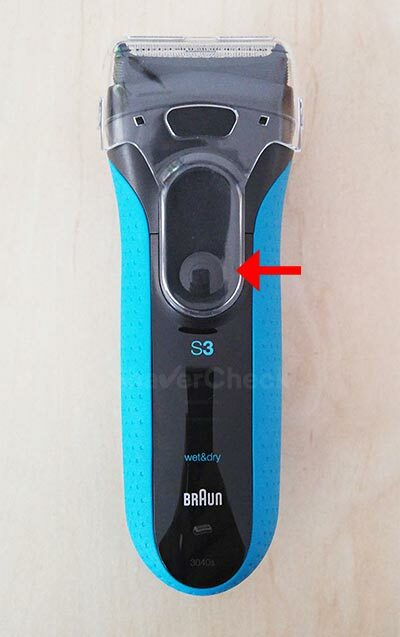 Does the Braun 3040s shaver operate on 220 volts? Yes, it is fitted with a universal voltage converter (110V – 220V). I had given up on electric shavers decades ago because of my sensitive skin, but decided to try the Braun 3040s after reading your review. Even shaving dry with it, I have not experienced any significant irritation. I do notice that it sometimes misses a hair, and have to go back over the spot repeatedly to get it, but this is so much more convenient than a manual razor that it’s worth the extra effort! Thank you for the review! Thank you for taking the time to share your experience with the 3040s. I’m glad to hear you found the review helpful. Less advanced electric shavers can miss stubborn stray hairs, but as you said it is a minor inconvenience given the benefits. The charger unit does not fit my normal bathroom shaver point. Do I have to buy a special plug unit? You only need an adapter plug that will fit your socket. The replacement foil is near cost as much as the razor. come on Braun get these foil prices down, or will be chaning make. The price usually varies between $20 and $25, which is lower than what you’ll be paying in the case of other foil shavers. Besides the long hair trimmer, is there a difference between this model and the Shave & Style model which comes with a set of combs? No, absolutely no other differences between it and the 3010BT. How is the sound and effectiveness of the trimmer compared to a panasonic Arc 4. The sound of the Arc 4 has a higher frequency and you can perceive it as being louder because of that. As for the trimmer, the one on the Arc 4 is clearly superior, it cuts way better. Will the 3050’s Charge & Clean station work with the 3040? And if so, is the clean station available as a separate purchase? No, it won’t work with the 3040s or with any other Series 3 models that didn’t originally come with a cleaning station. Only the Series 7 solo models will work with a compatible station purchased separately.